TREASURED CELEBRATIONS AT BANGKOK’S MOST ELEGANT HOTEL. Weddings in Bangkok with the most picturesque of settings. 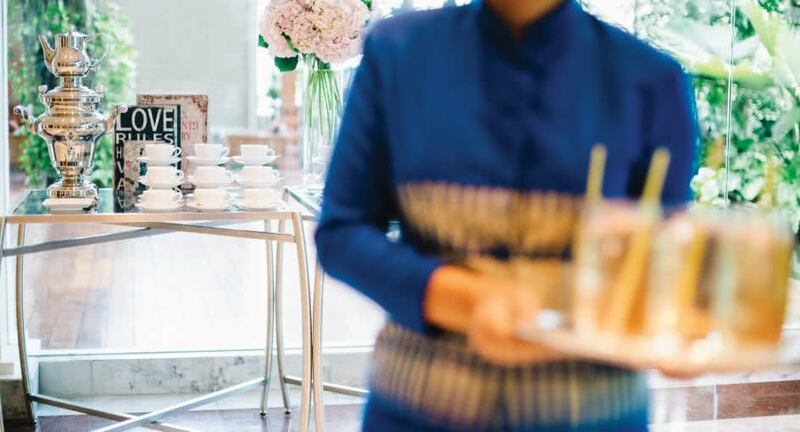 With iconic spaces, a dedicated wedding planner, and one-stop shop for all your wedding needs, Anantara Siam Bangkok Hotel is the perfect choice for your sophisticated celebration. Explore a range of settings, from opulent ballroom to tranquil gardens surrounded by lotus ponds. Dine on award-winning cuisine, with a tasting session served up by our chefs at the Wedding Galleria first. Choose the perfect wedding dress, decor, floral arrangements and dress, then leave the rest to us. The Bangkok wedding of your dreams begins at Anantara Siam. Welcome your guests to a classic ballroom with hand-painted murals. Elegant Thai features and side columns with gold leaf and silk drapery frame your magnificent wedding day. Ideal for up to 700 guests. The ‘Palace of the Gods’ is known for its stunning hand-painted silk cornices. Depicting the afterlife of the gods, this is the perfect space for other-worldly yet intimate events. Let your special day unfold from outside to in. Exchange vows on a lush terrace surrounded by lotus ponds. Serve cocktails and canapes in the elegant foyer, then move into the grand ballroom for an evening of dancing. Host grand celebrations or divide into smaller spaces for intimacy. Rich Thai decor and furnishings create a sense of place, perfect for Thai engagement ceremonies. Ideal for up to 400 guests. Surrounded by landscaped gardens, the pool terrace is serene and perfect for saying I do and a photo shoot afterwards.